Description: Four calling moose, three beaver tails, two caribou and a porcupine in a pine tree . . . 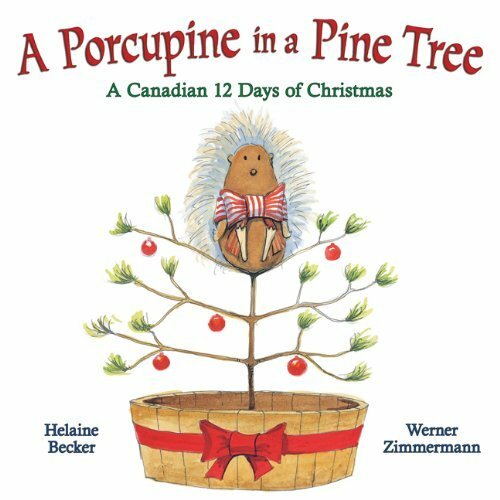 Celebrate Christmas Canadian-style with this hilarious adaptation of The Twelve Days of Christmas. You'll find squirrels curling, puffins piping, hockey players a-leaping and more. Helaine Becker and Werner Zimmermann turn the Christmas carol on its head, with a totally Canadian cast of characters wildly romping through the pages. A new holiday classic is born! Jake's Review: This book is really funny and the illustrations are even funnier. Now I understand why Mom was laughing so much when she read it. Even Jesse looked at some of the pictures without throwing it away. Why was there a picture with the Toronto Maple Leafs and the Stanley Cup - Dad says there has never been a colour picture with the Leafs and the Cup (Mom's note: Must go slap Hab loving hubby upside the head). I don't think the Americans will find this all that funny, it's more a book for Canadians. That Helaine Becker is a fun lady, you sure she isn't a boy. Mom's Review: I truly cannot describe how much I enjoyed this book. If you are a Canadian you will enjoy this. I disagree with Jake, I think the American will like it too. It is chock full of stereotypical Canadian images that is obviously done tongue and cheek. Just plain silly and delightful. 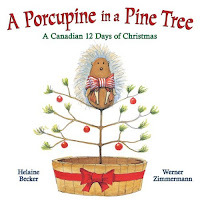 The illustrations are adorable and my only complaint is that I don't see a Tim Horton's roll up the rim cup in the illustrations-- now THAT is Canadian - well that and Beer, but it is a kids book. Now must go find my hubby and beat him up for all his snide comments about the Leafs. This book looks so fun, I think I'll have to get it for our school library. We have tons of Canadian students and teachers, they'll get a kick out of it. Excellent Jennifer - It really is fun!